The two characters in this text are referred to only as “you” and “she.” This is a story told in particulars by nobody named. Or I should say, this is a non-story, a story about the inability to happen. The characters are present only in relation to desire or a lack of desire. This poet’s novel is a fable of sexual deadness, numbness, told in a very compressed episodic manner. A man approaches a woman, asks if he can pay her to spend many nights with him. She is to be passive, silent. He is hoping to discover if he has the ability to love. 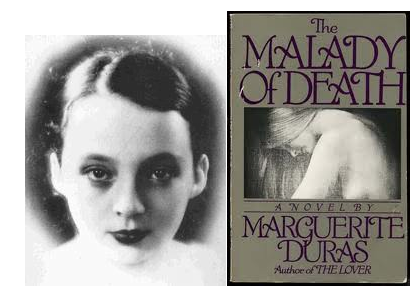 “She,” though she speaks little and is mostly asleep, is able to diagnose his “malady of death.” Though sexuality is often a subject in works by Duras, the real focal point is usually the question: what happens to a human being that renders them incapable of intimacy? Often the answer is war, but the focus is never war, but its psychological remains. This metaphoric process is movement akin to a poem. Duras tells the reader in her notes on staging that the man in the story should never appear. Instead, another man reads (does not perform from memory) the text. In this way Duras suggests that the central male character does not actually exist in her text. After reading this note one’s sense of the work is entirely changed. The main character, speaking most of the text, is an instance of absence. Duras has written absence into the center of the text in a way in which only becomes apparent once one has finished reading. The reader is required to rethink the experience of the text. Instead of moving forward, from beginning to end, as in most fiction, this text sends us back to the beginning. Duras also connects the white space on the pages of the text to time and silence. She writes “There should be great stretches of silence between the different paid nights, silences in which nothing happens except the passage of time.” . 1. Jeanne Hueving, conversation via email, Feb 2013. 2. Marguerite Duras, The Malady of Death, trans. Barbara Bray (New York, Grove Press, 1986), 56.